Park, Maryland surrounded by her lovingly family. grandmother, great-grandmother, aunt, and friend. joined the Gospel Trio. They traveled many highways singing the Gospel. For many years outside of the home, Willie Mae did domestic work. She also drove many people to different destinations. students on field trips to the Cook Farm to view the "turkeys." Cook, Mykeisha Hawkins, and Sheaneea Cook. Dawn Ray, Lingerine Robinson, Linda Jones, and the Bishop family. nieces, nephews, cousins, and other friends. To send flowers or a remembrance gift to the family of WILLIE MAE COOK, please visit our Tribute Store. 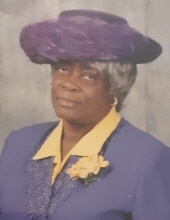 "Email Address" would like to share the life celebration of WILLIE MAE COOK. Click on the "link" to go to share a favorite memory or leave a condolence message for the family.